A thespian riddle: why would a playwright kill off the only interesting character of three at the end of Act One? Answer: to bore the audience to death in Act Two. Conflict. Character arc. Resolution. Reversal. Catharsis. Pay-off, where art thou? What is it with today’s crop of “award-winning” young playwrights? They endeavor to write slice of life hyperrealism, filled with seedy, unwashed, foul-mouthed characters, caricatures mostly, that do little to transform or inspire or amuse an audience (and don’t have much in common with the lifestyles of well-funded grad students in trendy arts MFA programs). Tranche de la vie? More like truncheon…. Upstart Productions presents Annie Baker’s The Aliens at the newly revitalized Magnolia Lounge in Fair Park through August 31. The space makes a good fit for this determined youngish company that’s had no functional performance venue for a while. 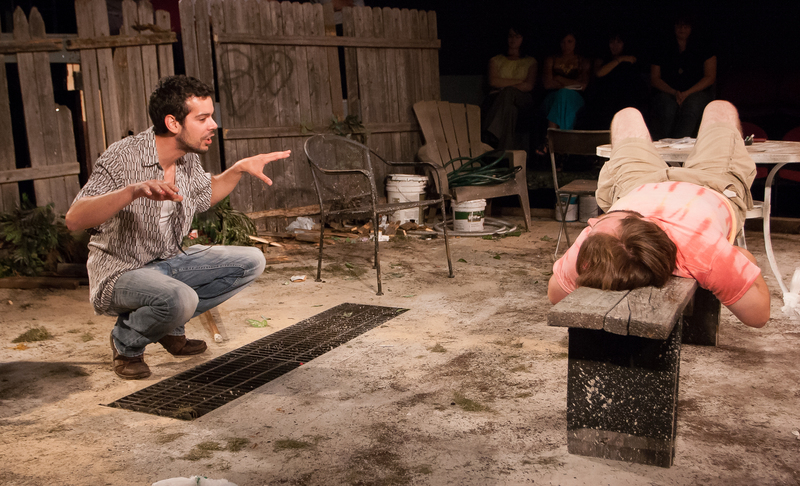 Recognized for its superlatively designed and executed sets (Talk Radio, SubUrbia, The Violet Hour, to name three), the company follows suit with its design for the Baker show: the unglamorous back yard of a bar/coffee house/ restaurant strewn with assorted trash bins and beat up old lawn furniture. Playing hyperrealism in the round presents unique challenges for actors and director; but The Aliens’ set, with no scenic design credit in the program, defines its environment with a vengeance and adds to the suspense and intrigue of Act One. The show’s sole catalytic, energized character is Jasper, a Beat generation-inspired writer and Charles Bukowski fan, occasional drug user, general cynic and guitarist. Intense, angular Joey Folsom brings an explosive, feral quality to the role, keeping the audience on edge, wondering what he might say or do next. 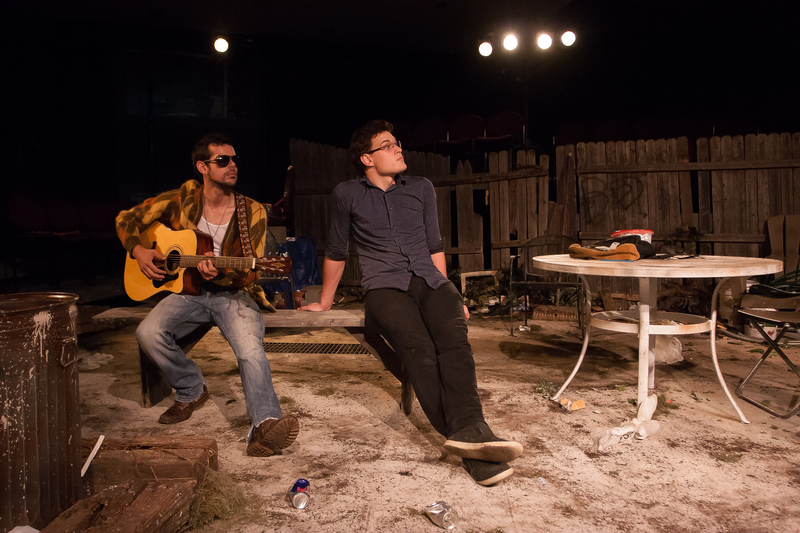 The other two characters, KJ and Evan, played ably by Tim Maher and Justin Duncan, function secondarily as foils to Jasper’s anguish, excess and life dilemmas. When Jasper dies at the end of Act One, so does the play. Act Two consists of a series of short, jagged scenes, KJ and Evan’s attempts to cobble together a relationship minus Jasper and define themselves. They are boring characters, without any of Jasper’s color or nuance. This reviewer kept hoping there would be a surprise pay-off, a reversal or revelation, at Act Two’s end. Evan sings a 60’s protest song, accompanying himself weakly on Jasper’s guitar. KJ tells him that he will “go far”. I’m solidly alienated from this sort of trite, quaint fluff, masquerading as real theatre. Directed by David Denson. Show dates: 8/14-17, 21-25, and 29-31. Times: Performances start at 8:00 p.m. Seating at 7:30 p.m.